Am I the Only One Who Thought the Last Scene of Batman Begins Was Kind of Slashy? So, my gaydar is overactive, which means in real life, I think everyone is gay, or has a crush on me, or, strangely when it's guys, both; and in movies or TV, I think everyone is gay and in love with their friend. So, I guess I'm a prime audience for slash fiction, which I've talked about before. I'm a little surprised, though, because if I was going to guess that my slash-meter would go off for any pair in Batman Begins, I would have predicted that pair would include Dr. Crane, played by Cillian Murphy AKA my ideal of beauty. But, I don't think he actually had any scenes with any other actors in the whole movie. But again, I can't be sure. I have this condition where I go into a blind rage whenever the camera leaves his face. As far as I know, Crane only interacted with abstract fields of red for the whole movie. Look how cute Cillian Murphy is in this movie!! Me: Yeah, I know, scarecrow! So, Jonathan, you know that, now that you're basically permanently crazy from (PREDICTABLE SPOILER!) getting gassed by your own poison, there's no reason for you to wear that hideous mask anymore. Me: Okay, okay, leave it on, leave it on. You know what? It's a part of you, and I love that. Me: ...Right. Yeah, honey. 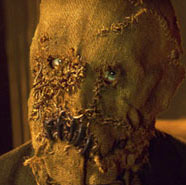 Scarecrow. Great. Commissioner Gordon: I never thanked you. Batman: You'll never have to. Gordon: You had me at "Don't turn around. You're a good cop; one of the few." Batman: I don't like crazy-making poison. It's coarse and rough and irritating and it gets everywhere. Not like here. Here everything is soft... and smooth. Gordon: The problems of three little people don't amount to a hill of bats in this crazy world. Batman: I like how it takes you an hour and a half to order a felafel. Gordon: I like to start my notes to you as if we're already in the middle of a conversation. I pretend that we're the oldest and dearest friends- as opposed to what we actually are- people who don't know each other's names and met in a chat room, or rather, in my office when you put a stapler to my head and pretended it was a gun. What will the Batman say today, I wonder. I turn on my computer, I wait impatiently as it boots up. I go online, and my breath catches in my chest until I hear three little words: You've got mail. I hear nothing, not even a sound on the streets of Gotham, just the beat of my own heart. I have mail. From you. Batman: Commissioner, fetch me that batarang. I'm just saying, it seemed a little gay. But that's probably just me.